The jobs report announced a few minutes ago in the United States was a disaster on paper. The nuts and bolts of the number provided a 74,000 rise in payrolls on expectations of 200,000 (or more by most economists). Last month's rise was enormous at 226,000 new jobs added. The month over month decline was the largest since December 2010. The unemployment rate fell due to over 300,000 people "dropping out" of the labor pool. This group is composed of people that have seen their unemployment benefits end, have given up looking for work, or decided to retire. 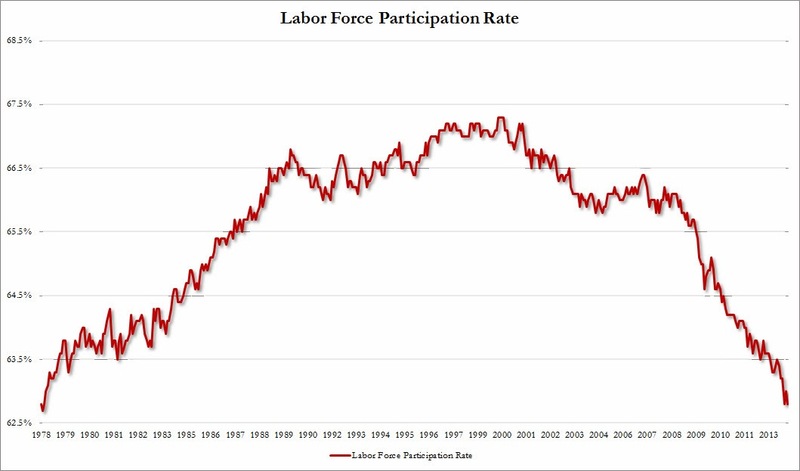 Looking at the chart below you can say that the labor force participation rate is now back at the point we were at in the late 1970's. What is lost on the data is that as recently as the 1970's (and certainly in the 1950's and 1960's) it took only one member of a household working to take care of a family. Women worked during that time because they wanted to, not because they had to. As discussed numerous times in the past, the biggest dilemma facing the Fed is the real economy is not recovering (unemployment rate falling due to people giving up looking for work) while froth and asset bubbles are now everywhere (risk assets at nose bleed prices). I would like to point out that the jobs number should be looked at based on the trend, not a specific month's data. The two basic trends as I see them are 1) unemployment in general is improving at a sluggish pace 2) a large portion of the economy is not recovering seen in the continuous monthly decline in the participation rate. 1) What matters most in the Employment Situation is the overall trend in hiring. Is it continuing what it has been doing for the prior three months? What matters is not whether it is expanding or contracting, but when it reverses that trend. 2) In a labor force of 150 million people, the change in net monthly new workers minus those no longer employed — essentially what the nonfarm payroll report measures — is a rounding error, a miniscule one tenth of one percent (i.e., 150k out of 150m). 3) If you use the correct long-term hiring cycles, you can get a pretty good estimate of likely hiring patterns. Since we are now in a post-credit-crisis recovery period, you should expect a mediocre but slowly improving job creation. That is what has been happening. 4) The model that produces the monthly number is part measurement (establishment surveys), part extrapolation (birth-death adjustment). 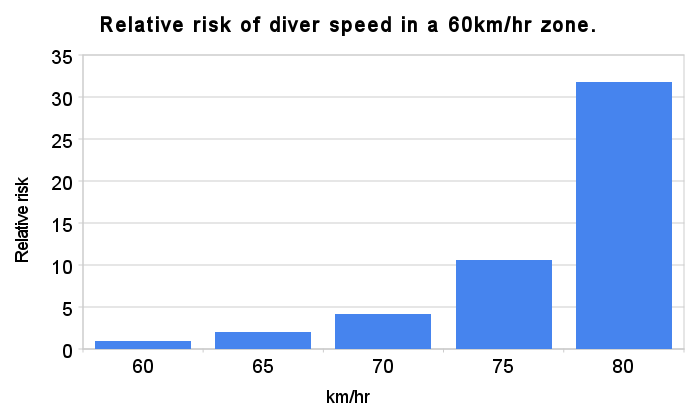 This is then revised, as more and better data comes in later. The overall NFP number is subject to subsequent revision next month and again the following month. The model gets re-benchmarked, is seasonality adjusted, as one-off weather or other events impact (and that impact then attenuates away) the overall NFP series. 5) Like all models, the Bureau of Labor Statistics model is flawed, but not useless (to paraphrase statistician George Box). That is why looking at the overall trend versus any specific data point is so much more valuable. 6) Last, while hiring is a well-known lagging indicator, we can look at the three components that often provide hints as to future hiring activities. I hesitantly call them leading components, but they do help to shed insight each month into whether we are improving or backsliding. They are: Hours Worked, Wages, Temp Help. As a business owner, one of my favorite shows on television is Shark Tank, where entrepreneurs pitch their company to a group of investors in search of both capital and strategic business partners. One of the investors on the show is Kevin O'Leary (nicknamed "Mr. Wonderful"). Kevin appeared on CNBC this week providing three minutes of fresh air from a commentator who creates businesses, jobs and wealth within the United States. I watched this movie from Frontline earlier this afternoon which provides an excellent behind the scenes look at what took place over the last few years with the biggest insider trading names on Wall Street. The combination of insider trading and high frequency trading put the statistical probability of a day trader sitting at home and beating the market at 0.0%. Stocks should be bought when they are on sale and held until they are expensive. That hold period is usually about 15 to 20 years during a typical secular cycle. 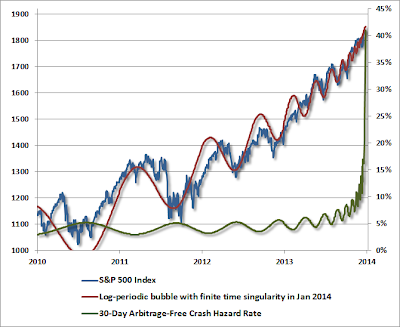 For more on high frequency trading see: The World's Largest And Most Dangerous Casino: A Machine Driven Stock Market. Most economic observers are predicting that 2014 will be the year in which the United States finally shrugs off the persistent malaise of the Great Recession. As we embark on this sunny new chapter, we may ask what wisdom the five-year trauma has delivered. Some big thinkers have declared that the episode has forever tarnished freewheeling American capitalism and the myth of Wall Street invincibility. In contrast, I believe that the episode has, for the moment, established supreme confidence in the powers of monetary policy to keep the economy afloat and to keep a floor under asset prices, even in the worst of circumstances. This represents a dramatic change from where we were in the beginning of 2008, and unfortunately gives us the false confidence needed to sail blindly into the next crisis. Although the media likes to forget, there was indeed a strong minority of bearish investors who did not drink the Goldilocks Kool-Aid of the pre-crisis era. As the Dow moved up in 2006 and 2007 so did gold, even though a rising gold price was supposed to be a sign of economic uncertainty. The counter intuitive gold surge in those years resulted from growing concern among a committed minority that an economic crisis was looming. 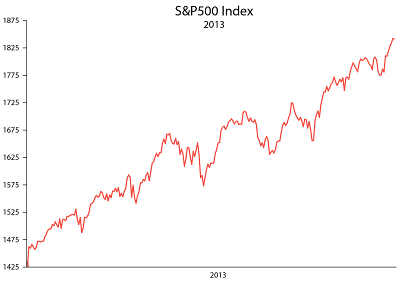 In the immediate aftermath of the crisis in 2009 and 2010, gold shifted into an even higher gear when those investors became doubly convinced that the extraordinary monetary measures devised by the Fed to combat the recession would fail to stop the economic free fall and would instead kick off a new era of inflation and dollar weakness. This caused many who had been gold naysayers and economic cheerleaders to reluctantly jump on the gold band wagon as well. But three years later, after a period of monetary activism that went far beyond what most bears had predicted, the economy has apparently turned the corner. The Dow has surged to record levels, inflation (at least the way it is currently being measured) and interest rates have stayed relatively low, and the dollar has largely maintained its value. Ironically, many of those former Nervous Nellies, who correctly identified the problems in advance, have thrown in the towel and concluded that their fears of out of control monetary policy were misplaced. While many of those who had always placed their faith in the Fed (but who had failed - as did Fed leadership - from seeing the crisis in advance) are more confident than ever that the Central Bank can save us from the worst. 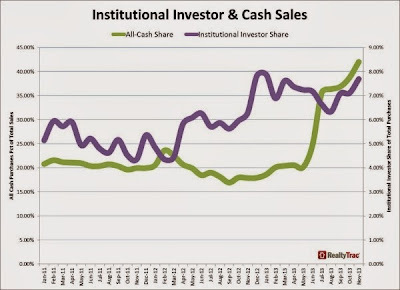 A primary element of this new faith is that the Fed can sustain any number of asset bubbles if it simply supplies enough air in the form of freshly minted QE cash and zero percent interest. 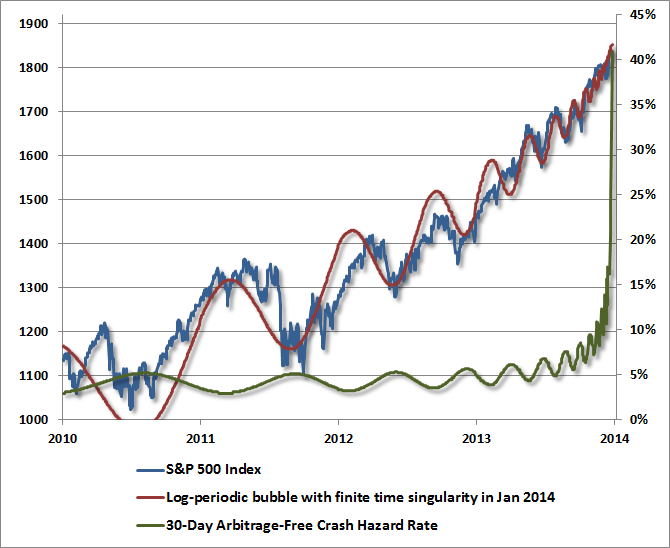 It's as if the concept of "too big to fail" has evolved into the belief that some bubbles are too big to pop. The warnings delivered by those of us who still understand the negative consequences of such policy have been silenced by the triumphant Dow. The proof of this shift in sentiment can be seen in the current gold market. If the conditions of 2013 (in which the Federal Government serially failed to control a runaway debt problem, while the Federal Reserve persisted with an $85 billion per month bond buying program and signaled zero interest rates for the foreseeable future)could have been described to a 2007 investor, their conclusions would have most likely been obvious: back up the truck and buy gold. Instead, gold tumbled more than 27% over the course of the year. And despite the fact that 2013 was the first down year for gold in 13 years, one would be hard pressed now to find any mainstream analyst who describes the current three year lows as a buying opportunity. 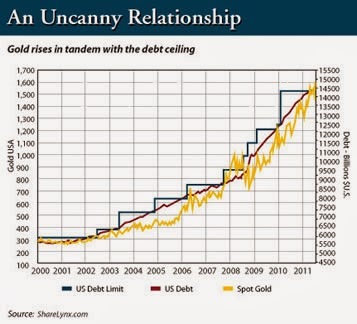 Instead, gold is the redheaded stepchild of the investment world. This change can only be explained by the growing acceptance of monetary policy as the magic elixir that Keynesians have always claimed it to be. This blind faith has prevented investors from seeing the obvious economic crises that may lay ahead. Over the past five years the economy has become increasingly addicted to low interest rates, which underlies the recent surge in stock prices. 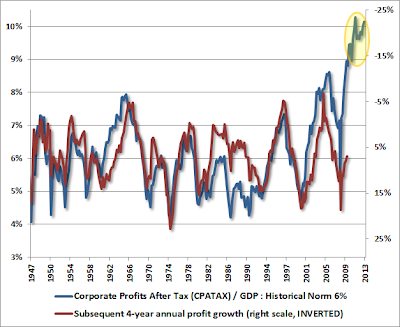 Low borrowing costs have inflated corporate profits and have made possible the wave of record stock buybacks. The same is true of the real estate market, which has been buoyed by record low interest rates and a wave of institutional investors using historically easy financing to buy single-family houses in order to rent to average Americans who can no longer afford to buy. But somehow investors have failed to grasp that the low interest rates are the direct result of the Fed's Quantitative Easing program, which most assume will be wound down in this year. In order to maintain the current optimism, one must assume that the Fed can exit the bond buying business (where it is currently the largest player) without pushing up rates to the point that these markets are severely impacted. This ascribes almost superhuman powers to the Fed. But that type of faith is now the norm. Market observers have taken the December Fed statement, in which it announced its long-awaited intention to begin tapering (by $10 billion per month), as proof that the dangers are behind us, rather than ahead. They argue that the QE has now gone away without causing turmoil in the markets or a spike in rates. But this ignores the fact that the taper itself has not even begun, and that the Fed has only committed to a $10 billion reduction later this month. In fact, it is arguable that monetary policy is looser now than it was before the announcement. Based on nothing but pure optimism, the market believes that the Fed can somehow contract its $4 trillion balance sheet without pushing up rates to the point where asset prices are threatened, or where debt service costs become too big a burden for debtors to bear. Such faith would have been impossible to achieve in the time before the crash, when most assumed that the laws of supply and demand functioned in the market for mortgage and government debt. Now we "know" that the demand is endless. 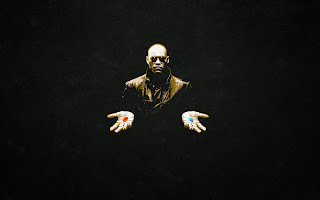 This mistakes temporary geo-political paralysis and financial sleepwalking for a fundamental suspension of reality. The more likely truth is that this widespread mistake will allow us to drift into the next crisis. Now that the European Union has survived its monetary challenge, (the surging euro was one of the surprise stories of 2013), and the developing Asian economies have no immediate plans to stop their currencies from rising against the dollar, there is little reason to expect that the dollar will rally in the coming years. In fact, there has been little notice taken of the 5% decline in the dollar index since a high in July. Similarly, few have sounded alarm bells about the surge in yields of Treasury debt, with 10-year rates flirting with 3% for the first time in two years. If interest rates rise much further, to perhaps 4% or 5%, the stock and real estate markets will be placed under pressure, and the Fed and the other "Too Big to Fail" banks will see considerable losses on their portfolios of Treasury and mortgage-backed bonds. Such developments could trigger widespread economic turmoil, forcing the Fed to expand its QE purchases. Such an embarrassing reversal would add to selling pressure on the dollar, and might potentially trigger an exodus of foreign investment and an increase in import prices. I believe that nothing can prevent these trends from continuing to the point where a crisis will be reached. It's extremely difficult to construct a logical argument that avoids this outcome, but that hasn't stopped our best and brightest forecasters from doing just that. So while the hallelujah chorus is ringing in the New Year with a full-throated crescendo, don't be surprised by sour notes that will bubble to the top with increasing frequency. 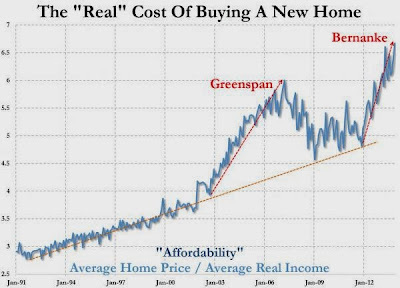 Ultimately the power of monetary policy to engineer a real economy will be proven to be just as ridiculous as the claims that housing prices must always go up. I greatly appreciate your patience over the past two weeks as I know my writing has been limited. I spent the last week of December with my father at my parent's new home in a retirement community in Florida called "The Villages." It is a remarkable place with over 100,000 residents, and everyone in the town commutes by golf carts. 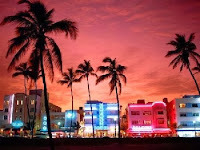 I spent New Year's Eve down in Miami Beach, Florida with seven of my closest friends. We enjoyed the beach, some great pool parties and some excellent football. We have a lot to cover as we begin the exciting new year in the financial markets. I have released the first half of the 2014 Outlook, which covers the U.S. asset markets in detail. Throughout the week I will release the second half, focusing on the remainder of the world. Thank you to the readers who continue to visit the site. My viewership grows every year and over 50 percent of the readers now come from outside the United States. I continue to spend more time on reading books, articles, newsletters, taking detailed notes and then writing my thoughts on this website than all of the other activities in my life combined. That includes my job, my business and preparing for my wedding which is coming up in just a few weeks. My wonderful fiance understands because she knows I enjoy working on this site more than anything else I do. I look forward to the year ahead. It should be far different than the last. We enter the year 2014 at a critical and fascinating juncture of history. The world that surrounds us has been masked by an illusion so powerful that it is now fully entrenched into almost every aspect of our lives. Moving through my days feels like I am standing on a street corner and watching the great illusionist David Blaine perform his famous street magic. When an illusionist first approaches a street audience and asks them if they would like to see magic, the audience is immediately skeptical that what is coming is some sort of trick to be solved. Over time, depending on the power and skill of the illusionist, many in the audience begin to believe that what they are watching is in fact not a trick, but real magic. This is part of what makes tricks so fun to watch because you view the audience move from the initial point of skepticism, to shock, and then to belief. 1. The mark to market accounting system was removed. This allowed banks to mark non-performing assets on their books at full value until those assets were sold. 2. The federal government implemented massive government spending and stimulus projects. 3. 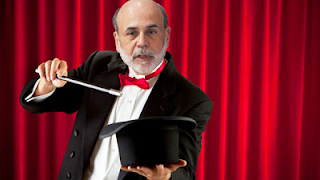 The Federal Reserve provided the encore: a now famous magic trick they called Quantitative Easing. These types of programs were put in place simultaneously by most major governments around the world during late 2008 and early 2009. Those countries that were not suffering a financial crisis but suffering from the global economic slowdown, like China, put policy 2 into overdrive. Like David Blaine approaching them on the street, almost everyone immediately understood that these magic acts were not true magic but some sort of trick being placed in front of them. The people of the world using common sense alone understood that you could not instantaneously "fix" a balance sheet by moving toxic assets into a locked room where no one can see them. You could not solve an easy money and debt crisis with far more easy money and debt. Skepticism was high as the magicians began their street performance. People (other than me) even wrote back then about how these "illusions" would only make the problems far worse at some point in the future. Then over time due to the power of the illusion, skepticism turned to shock and after five years running it has turned to belief. People at every level of society, from the blue collar worker to the CEO's of major companies now believe that what took place over the last five years is real magic. People believe that running $1 trillion deficits and printing over $1 trillion per year in currency will make a country fundamentally stronger and wealthier. Over the past three years people have written books that are purchased and taken seriously by academics which outline the reason we are not wealthier and more prosperous as a world is because we have not borrowed and printed more money. The psychology of the human mind is more fascinating to me than I can describe with words. When you are five years deep into an artificial asset price reflation, similar to what occurred after 5 years of reflation into 2007, almost everyone abandons their rational understanding of what is actually taking place. There are numerous reasons for this incredible human psychological trait. One reason is that the human mind looks for reasons to justify what it sees around it. It is a constant justification machine. This is why news headlines begin by saying "the stock market rose today due to higher month over month consumer sales." Or, "the stock market fell today due to lower than expected consumer sales." 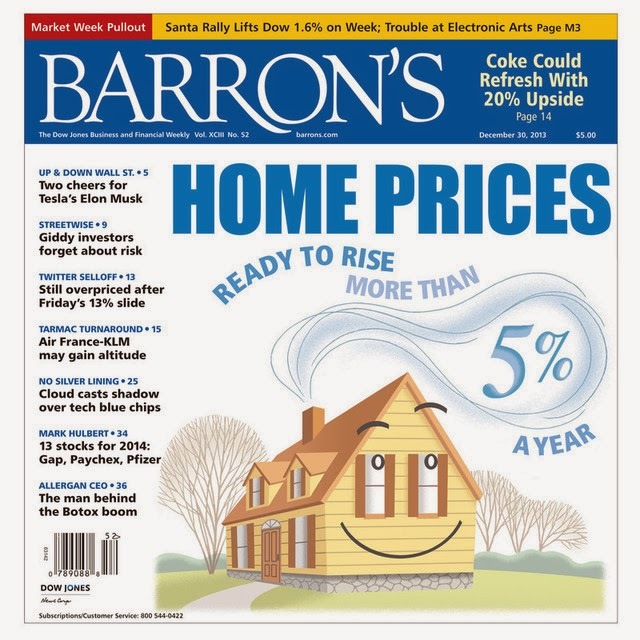 The consumer sales number released that day could be the exact same number in both cases, but the headline is written to justify why the market moved in that direction on that day. This comforts readers to take in information this way. It is why writing from a point of view where you are always looking forward, which is what I try to focus on here on this site, is less naturally enjoyable to the human mind. Many people can look around and feel that there is a serious disconnect between what is happening to the broader economy (the 99%) and what is taking place in the financial markets (the 1%). Eventually the natural human tendency wears on them and they are forced psychologically to find reasons to justify why the stock market is rising every day. Five years into an artificial asset price reflation people are psychologically exhausted. Websites such as this one no longer "make sense." We have reached the stage in the reflationary cycle when those that acted the most irrational in late 2007 with investor's money are not only recommending that people dive full force into stocks and high yielding junk bonds, but they are even taunting those that recommend safety. 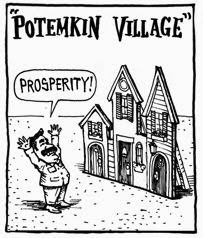 Someday we will look back in awe at the artificial Potemkin Village we live in today. But before that point, there will be a period of chaos and opportunity. I never imagined the world could return to this place so quickly. The opportunity for those that can maintain composure has never been greater. That simple sentence sums up the entire outlook you are about to review. While we will move through the details of what is taking place in debt, equity and real estate markets around the world, the most important concept to understand is that the financial markets today are a mirage of the real economy underneath it. 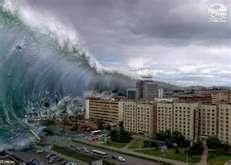 With that immediate danger already present, there are additional unseen rogue waves lurking around the world that we will review throughout this outlook. What is meant by complacency? This means that although the world may get better on the surface in 2014 (economic data continues to improve), many markets have already priced in this improvement and additional improvement in the years beyond. Warren Buffett made his fortune by investing in assets with a “margin of safety.” This means that even if things turned south, he was buying an asset at a 20% discount to its full value. Lenders follow this approach by asking for a 20% down payment on a residential or commercial real estate property. When looking around today, are investors taking on this margin of safety by purchasing assets at these price levels? Of course not. Investors new margin of safety is their confidence that everything will be better in 2014. They are 120% sure that the fundamentals will improve, giving them their 20% margin of safety. This type of mentality exists at the end of cyclical growth periods, where as the opposite mentality exists at the trough of cyclical downturns. Will understanding that high yielding risk assets are being purchased today at prices with no margin of safety guarantee that they will fall tomorrow? Of course not. 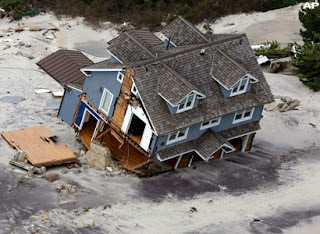 Having insurance on your beach home in south Florida only matters when the hurricane arrives. Until that point, you feel like an idiot for making the monthly premium payments. "The problem with bubbles is that they force one to decide whether to look like an idiot before the peak, or an idiot after the peak. There's no calling the top." We have never been in a situation remotely close to this period in history where every major central bank around the world is running enormous QE programs simultaneously. Before 1971, the world had never experienced an environment where every currency on the planet was backed by nothing. We are so far away from "charted territory" that if someone tells you they know where an asset price is going to be tomorrow morning, you should walk away quickly. We live in world today of almost crystallized certainty that our central banks and government leaders have rescued us from the financial crisis and the global economy is back at full strength. That certainty or complacency has created a magnificent opportunity for those that can understand the illusion is only a trick. How do we know this certainty and belief in magic exists? We can hear it in the way investors, business owners and the media discuss the world. We can read it in sentiment indicators. We can watch it in the way that people are piling into risk assets in search of just a small taste of “yield.” We can pull up a Bloomberg screen and see that junk bonds are currently trading at the highest prices in recorded history. Throughout this outlook we will review many of the asset classes that now fully believe the great illusion is real magic. This belief is reflected in their prices. We will finish with some of the few assets that are still trading at reasonable valuations and where to hide while you wait for the greatest buying opportunity in history. We will begin with 2013's greatest spectacle on earth, the U.S. stock market. Before taking a look at U.S. real estate or looking at the economy from a global perspective, we must first review the one asset class that has experienced the greatest possible benefit from the grand illusion: U.S. stocks. The chart below shows the breathtaking rise during 2013. For reasons most people understand completely, U.S. stocks are fundamentally better to purchase at times when they are inexpensive relative to their earnings and hated from a psychological perspective. 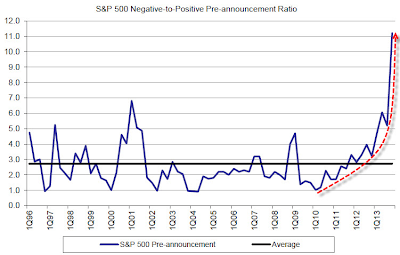 While it is arguable that stocks were not inexpensive from a historical price to earnings perspective in March of 2009, we saw that sentiment levels toward stocks represented a buying opportunity during that period. During the week stocks bottomed in 2009, the daily sentiment index reached 2% bulls. That means 98% of investors felt stocks would move lower from that point. For more on how people felt toward stocks at that moment see Flashback to March 2009: What Was The Outlook For U.S. Stocks? On the opposite side of the coin, it is easy to understand that a less attractive time to purchase stocks is when they are expensive relative to their earnings and loved from a psychological perspective. We saw this during December of 2007. For a review of how investors felt toward stocks during that time see Flashback to December 2007: What Was The Outlook For U.S. Stocks? As of today, January 5, 2014, I believe that based on the price of U.S. stocks relative to earnings and sentiment, they are more dangerous to purchase today than almost any point in history. This includes 1929, 1987, and 2007. Market observers will immediately shout that during the mania years of the late 1990's that stocks reached a price level far more dangerous than where we stand today. They would be correct, for the market as a whole. However, back in 2000 the most pricey stocks skewed this number greatly. If you review the stocks in the S&P 500 individually, the median price to revenue multiple is actually higher today than it was in 2000. Smaller stocks were more reasonably valued in 2000 compared to today. 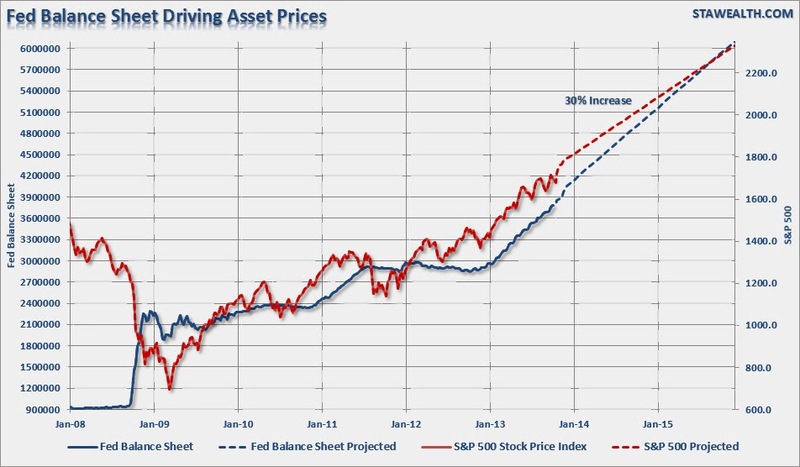 Putting that aside, I think arguing for stocks to move higher in the future because they are less expensive than the peak of the greatest bubble in history is the equivalent of saying riding in a car at 150 mph without a seat belt is safe because you have not been drinking before you drive. There are two reasons why a general consensus always exists to enter the stock market at the worst possible time. 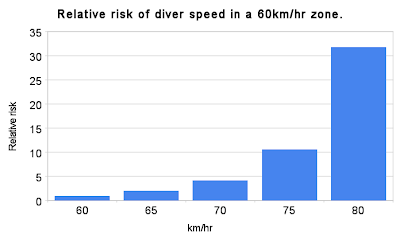 The first is career risk. Imagine you are a financial advisor with a wife, two children, a mortgage and plenty of bills. 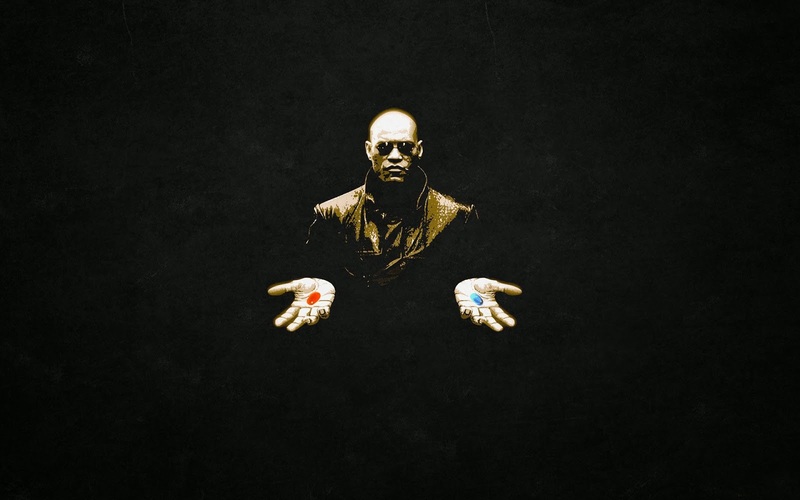 You know entering the year 2014 that the market feels mildly (or wildy) overpriced. You know that recommending that clients put more money to work in the market could potentially hurt them. Then you look around and see that every major market forecast from your competitors has the market rising by at least 10% in 2014 and recommends U.S. stocks as the best long term investment for clients (open any media or investment publication other than this website and that is what you will read). What if this advisor were to say that he felt stocks will finish the 2014 year at a loss and clients should just hold new money in cash? Two things happen. The first is that his firm does not receive the commission or management fee for the new money clients are keeping on the sidelines. The second is that the advisor has distanced himself from the herd. If he says that stocks will rise 10% like everyone else then if he is wrong he will go unnoticed from the crowd. As we just discussed, this is exactly what occurred with forecasts in late 2007. The same scenario exists in the hedge fund world. Hedge fund managers send out quarterly statements to their clients showing their returns. Clients then compare how their money performed against other hedge funds. 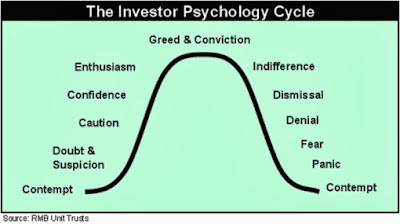 If the manager is under invested in the market during the tail end of a mania (believing they are doing the best thing for their client's money), they will face massive redemptions. The second reason occurs in the minds of the general public. Based on natural human psychology the most comfortable tendency is to move and exist within a crowd. After interviewing thousands of people following the debacle and losses in 2008, behavioral psychologists were fascinated to find that people were less distraught than they would have anticipated. What was the main reason provided for this? Everyone around them was experiencing the same thing. 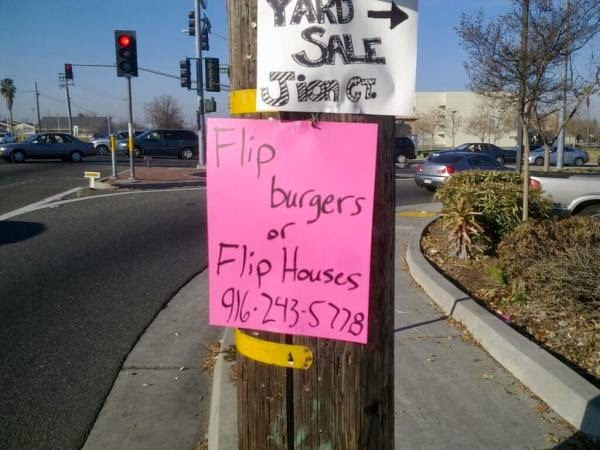 Home prices were falling for their neighbors and friends. All their friends talked about how their 401k's were taking massive losses at dinner events. The same scenario exists on the way up. During the initial rise in stocks in 2009 and 2010 it was easy to keep money on the sidelines. Now, after five years of watching prices rise and hearing their friends discuss how great their portfolios are performing at parties, it is almost unbearable psychologically to stay out of the market. Just as with hedge fund managers, clients look at their 401k mutual fund options to start the year. They look at which funds performed the best the previous years and over allocate their investments to those funds to start the new year. These two simple reasons are why investors are always caught so wrong footed when the market turns. After watching it occur in 2000 and again in 2008, I thought it would be decades before the same mistakes were applied. Now, less than five years into the most recent artificial market rise, investors have completely forgotten the past. It is both fascinating and remarkable to watch. John Hussman of Hussman Funds provides an excellent (and free) commentary every week on his website. Over the past month he has provided an in depth analysis on the stock market. Part of his analysis includes a chart I have shown in the past from Didier Sornette, showing the typical wave pattern of a market during a cyclical advance. The market gyrates violently during the early part of the advance as participants are afraid and sell off gains. During the latter stages the declines become more and more shallow as every dip is immediately bought ferociously. 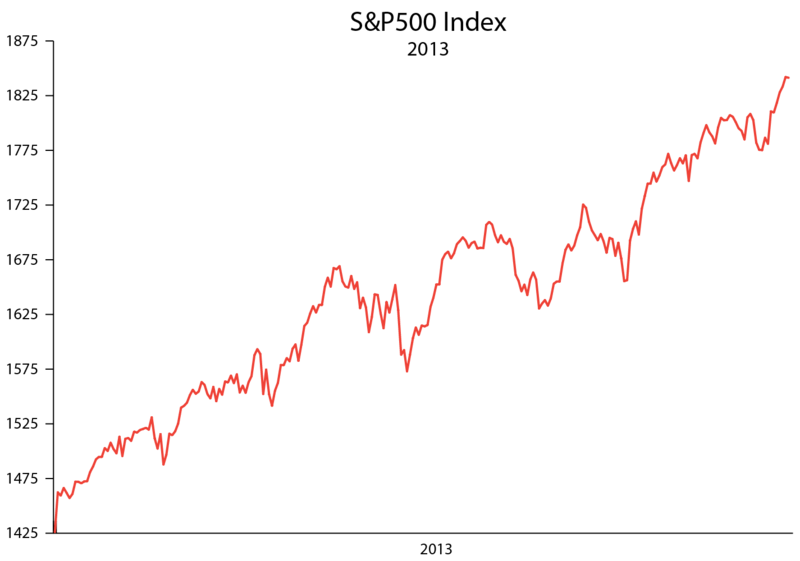 The wave pattern of the cyclical market cycle is shown below in red and laid against the S&P 500 in blue. The similarity between the two is astounding. The green line shows that the risk of a crash begins to grow exponentially as the market moves further along without a major correction. 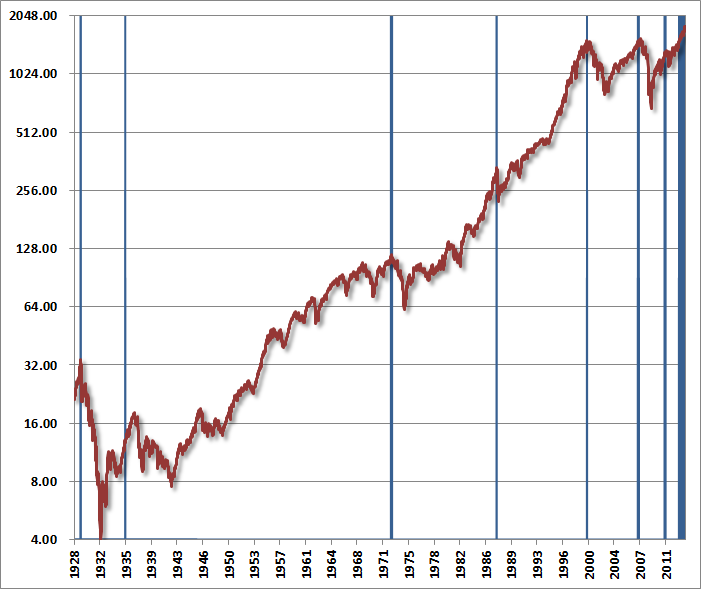 Hussman shows that the market has reached the terminal phase of the advance. The market is already at the stage where it is "ready" to decline significantly. Hussman uses an extensive set of historical data to determine a real time over valuation or under valuation metric for the market. The chart below shows that the market has triggered his overbought, over bullish, rising yield condition since February 2013 without an "event" occurring. This is the longest period in history that these factors have been in place without a sell off event hitting the U.S. stock market. Based on his historical data set you can see what occurred when the market triggered these levels in the past (blue lines). The length of the current mania in place while all the data is aligned for a decline only solidifies the danger facing the market in 2014. Its resolution should be historic. You will often hear from analysts that based on the price to earnings ratio, U.S. stocks are currently cheap. This is because the analysts use a forecast for earnings, not what is actually taken place. U.S. stock prices were sold to the public as "cheap" in November of 2007 because earnings were forecast to rise much higher in 2008. Then earnings collapsed. This is how it works at market turns. There are various tools to use for showing real price to earnings, but the most common is the Shiller P/E ratio. It shows that the market today is now at price levels above where previous secular bull markets peaked. The Shiller P/E ratio has come under fire from sell side analysts over the past few months (those that sell stocks for a living). While it is beyond the scope of this discussion, a response to the validity of the index can be found here. Speculators are now using record amounts of borrowed money to try and push stocks higher and supercharge gains. NYSE margin debt has reached almost 2.5% of GDP, which is a level only seen at the 2000 and 2007 market peaks. Total margin debt continues to hit new record highs. Net credit balance is back in the dangerous range of previous corrections/collapses. The Rydex Leveraged Bull/Bear reached an all time high for the bull camp at 6.12 in May and August of this year. It has since doubled from that all time high, crossing 12 on the bullish side. 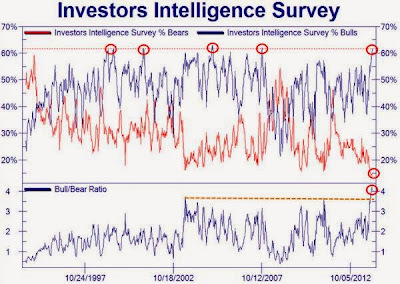 Sentiment toward the market has roared from record high levels to earth shattering levels of bullishness. 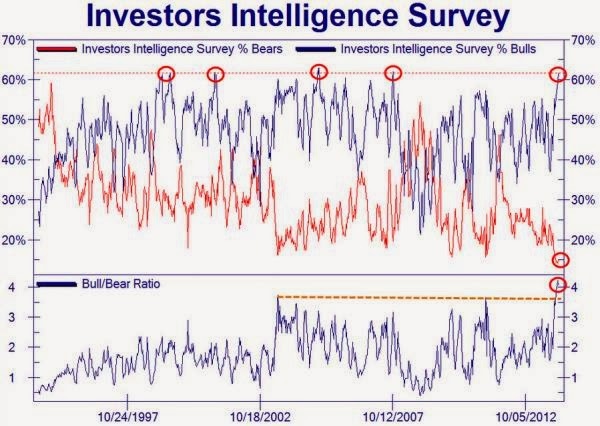 The Investors Intelligence survey has reached a new record divergence between those that are bullish and those bearish. The bullish sentiment toward the S&P 500 is shown below. The red line shows sentiment levels have now surpassed post 2008 highs, just as the S&P 500 has soared through 1830 (becoming the most expensive it has been during the rally). The CBOE total put/call ratio on a 5 day average has blasted to the most extreme point in over 8 years. Option traders are now betting 1.5 calls for every put. The National Association Of Active Investment Managers 3 week moving average finished the year at an all time record high. The average investor (seen in mutual fund flows like 401k's) has moved out of stocks for four straight years. In 2013 they returned with a vengeance. The Weekly Association of Individual Investors poll jumped to the second highest reading since 2009. 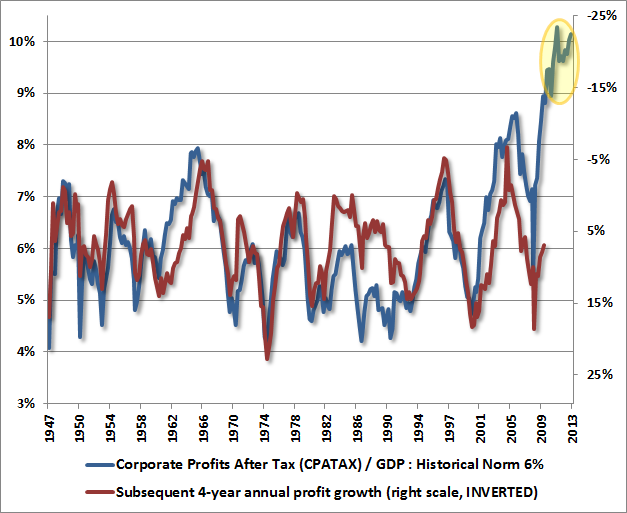 Corporate profits as a percentage of GDP are at all time record highs. Over the long term this percentage tends to mean revert. A slight reversion to the mean would mean very big trouble for stocks that have priced in this chart rising exponentially forever. 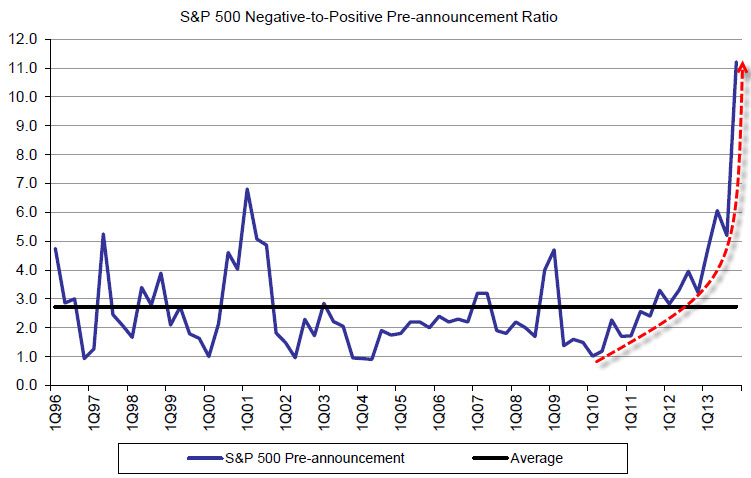 This reversion may already be taking place as the S&P 500 showed an 11.4 negative to positive pre-announcements guidance ratio. This is the most negative ratio on record by a wide margin. The secular bull market in the early 1980's began at 5 to 7 times earnings valuations and a dividend yield of 6 percent. Interest rates and inflation were at extremely high levels with rates just beginning their 30 year decline. All levels of the U.S. economy were just beginning the largest leverage ramp in history, which would take consumption levels to 70% of GDP. 401k plans had yet to come into existence which would pull the general population into the market. Stocks were the most hated asset on the planet after falling and trending sideways for 17 straight years. That was an incredible time to purchase stocks. The back drop for the stock market today paints the exact opposite picture described in the early 1980's. The average secular bull and bear market for U.S. stocks lasts 17.6 years. We are now 13.8 years into the current bear market. I believe we have one more major decline coming in the markets that will surprise almost everyone. At that point the secular bottom will be in place and it will create the greatest buying opportunity to purchase U.S. stocks this generation will ever see. While the froth in the U.S. stock market has taken center stage, the secondary story of the year has been the spectacular move higher in many residential real estate markets across the United States. 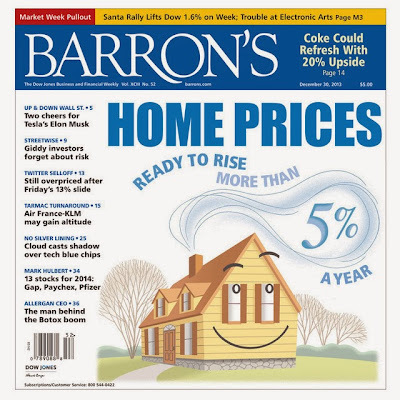 Just as with stocks, this move higher has led the media, U.S. citizens and potential home buyers to believe that the bottom has been solidified and housing gains can now be expected every year. While the story is slightly different this time around, many similarities such as flipping houses for a living have re-emerged with a vengeance. The major force behind home prices bottoming in early 2012 and rising through 2013 was the relentless decline in mortgage rates. After the housing market collapsed in 2006, the government and Federal Reserve became the housing market in 2008. The government has insured or purchased nearly 100% of the loans since then, with these loans being packaged and purchased by the Federal Reserve with printed money (quantitative easing). In 2013, the Fed purchased three times the amount of new mortgages originated. 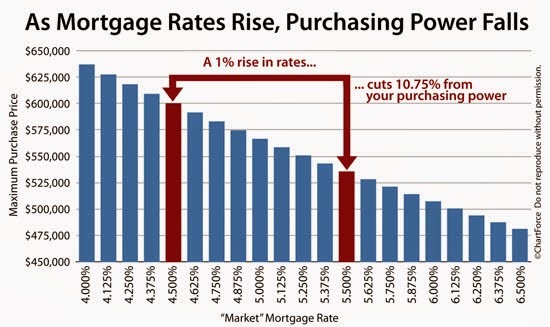 After mortgage rates rose to just under 7% for many loans in 2008, rates for a 30 year mortgage fell to an almost unbelievable 3.35% in May of 2013. We have covered many times in the past that falling mortgage rates combined with the exotic loan products available allowed more and more home buyers to enter the market in the 2000 to 2006 run up in prices. Rising "able" demand equaled rising prices. We live in a more rational world today, the most exotic loan products do not exist and hopefully will not return. Today's buyers in general need an income, a down payment and a credit score. This means that the real affordability for homes today is derived from income, home prices and mortgage rates. If incomes rise, home prices fall and mortgage rates fall and more buyers will be able to purchase a home (able demand increases). If any one of those trends are reversed, then less buyers will be able to purchase a home. Understanding this allows us to determine how affordable home prices are today, which then allows us to determine price direction in the future. In order to create a larger and larger pool of home buyers, which is what is needed to continue to push prices higher, the three factors (income, rates, prices) need to be moving in the correct direction together. The problem is that while two of the three were moving in the right direction from 2006 through 2012 (prices and rates were falling), all three are now moving in the wrong direction. Prices are rising and incomes are stagnating or falling. What about rates? Mortgage rates bottomed in May 2013 at 3.35% and have risen to 4.7% today. While this may sound like a small rise the difference every 1% makes on the amount a buyer can spend on a home is enormous. If less people can afford to purchase a home at a certain price level what happens? The prices fall to meet market affordability. For a complete walk through of why homes are less affordable today than they were in 2003 - 2006, I would highly recommend reading Mark Hanson's Housing Bubble 2.0. The large bidder in the market that has stemmed these three major headwinds (thus far) has been the entrance of Wall Street into the residential home market. Large investment groups such as Blackstone have raised tremendous amounts of capital (through extremely low Federal Reserve gifted interest rates) to purchase homes cash and rent them out. These groups are now even packaging these rental streams and selling them out into the secondary market. Rental properties have now flooded many of the largest cities. Many of these investment groups are now starting to pull back the reigns on their buying as the rental rates have slowed. Most of the (available non-shadow) bank owned distressed inventory has already been purchased and the higher real estate prices and interest rates no longer work with their cash flow models. If this buyer slows it would take a large piece of the price momentum out of the market. This is already beginning. Sales of existing homes have fallen for three straight months. Unless something drastically changes in regards to real income skyrocketing, mortgage rates collapsing back below 3.5% or exotic loans re-entering the market, home prices will face major challenges in the year ahead and beyond. One of the better books released in 2013 was "Fate Of The States," by Meredith Whitney. It is a phenomenal outline of the trouble coming in the municipal bond market and how the states with their budgets under control, found mostly in the center states of America, will prosper as businesses and new citizens move there. 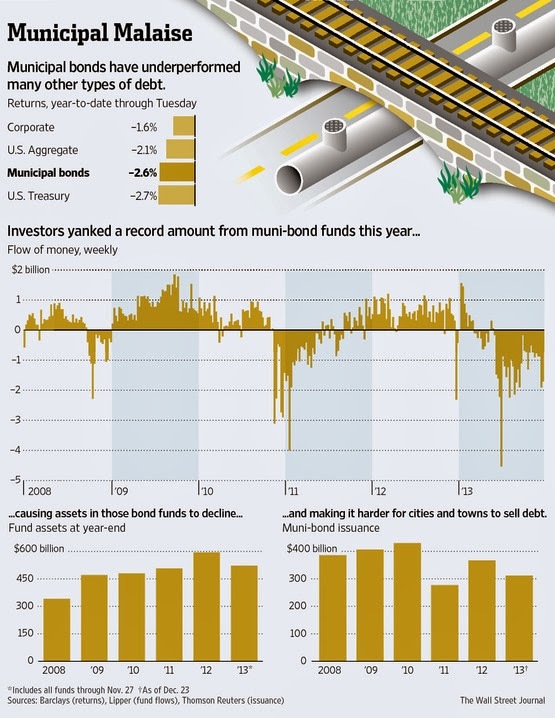 The municipal bond market, unlike other more speculative or junk portions of the bond world, felt the first taste of a tremor in 2013. This is only the first look of what is to come in the years ahead as the cities and states that over leveraged during the housing boom are left with bloated debt piles and massively underfunded pensions. Detroit has been the landmark story in the municipal world, but it will only be the introduction. Many cities are watching with a very close eye on how the Detroit bankruptcy is handled because it will serve as a blueprint model for cities in the future. Cities will soon learn that the only way to restructure pensions, which are drowning city tax receipts, is the bankruptcy courts. The muni bond market is $3.7 trillion in size and the bonds are held by mutual funds (401k's), insurance companies, banks and other pension funds across the country. A repricing of interest rates in the market (which investors will require to take on the newly discovered risk), will crush the values of the bonds currently held within portfolios and simultaneously make it more difficult or impossible for cities to continue to borrow to survive. This will lead to additional defaults which will then push rates higher. The next major trigger for the market may come from a tiny island located off the United States. That island is Puerto Rico, an unincorporated territory of the U.S. If you were to compare the United States to Europe, Puerto Rico would certainly be the Greece. It would take 70 Puerto Rico islands to cover the state of Texas, but the size of the island's debt burden is in the same league as California and New York. While New York and California have 19 million and 38 million people living in their states, Puerto Rico holds only 3.6 million people (a number falling rapidly) to try and service the debt. The Puerto Rico economy is in shambles. The current unemployment rate is just under 15%. 40 percent of the income its citizens receive comes in the form of transfer payments with 27% of the population on food stamps. They have been in recession for 95% of the last seven years. Puerto Rico must refinance $700 million in debt by June (on top of the $850 million in they are "projected" to need to borrow to cover their annual deficit). The problem? The market is no longer lending them money. In order to get their funding, they are turning to their local banks - the same strategy currently being put in place by the bankrupt countries in Europe. It is a ponzi scheme on a massive scale, and the losses will be enormous. 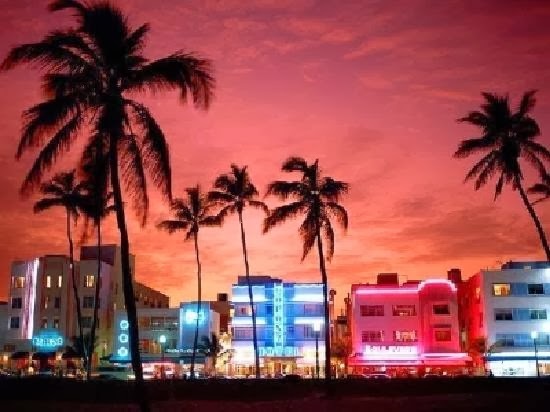 How would a Puerto Rico bankruptcy compare with Detroit, the biggest in history? It would be five times larger. Trouble in Puerto Rico in the months ahead could be the trigger that reprices the rates of the $3.7 trillion muni bond market higher, which would then push those cities on the edge of survival over the cliff.